First off, if you are not familiar with summer/winterlicious, please hit up Google. You don’t want to miss out on a chance to enjoy a 3-course prix-fixe meal at your favourite restaurant, or at one you’ve been dying to try but didn’t want to pay full price. There are usually approx 200 restaurants to choose from, so you have some time to do your research before winterlicious rolls around. 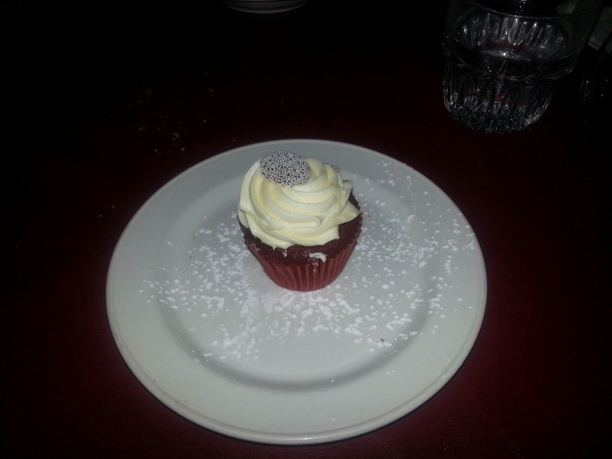 Your TNL gals had taken advantage of winterlicious; you can read our reviews here and here. I FINALLY had the pleasure of dining at Big Daddy’s Bourbon St Bistro & Oyster Bar during summerlicious and couldn’t wait to share my experience with our readers. I had heard many great things about this restaurant, so it was time to see for myself. If you’ve been to cajun cuisine restaurants, you’d know the charm that I walked into at Big Daddy’s. There were signs indicating Bourbon St and lights hanging across the ceiling to add an at-home feel while dining. I’ve never been to New Orleans, but this is exactly how I imagined it would feel. The washrooms were down a hall that had a sign with an arrow saying “Back to way you came” in case you were inclined to get lost. I got quite the kick out of that. The server was pleasant and answered any questions that were asked. She was prompt in returning to our table to check up on us or remove any plates, even on this busy Saturday night. She managed to make us feel like we were taken care of, even though she was serving a few tables. I ordered: Coconut shrimp (3) (Jumbo shrimp in a sweet coconut breading, served with marmalade-style dipping sauce), and the first thing I had to note was that they didn’t taste like “store bought” shrimp thrown into the oven from frozen. No, these were the real deal. 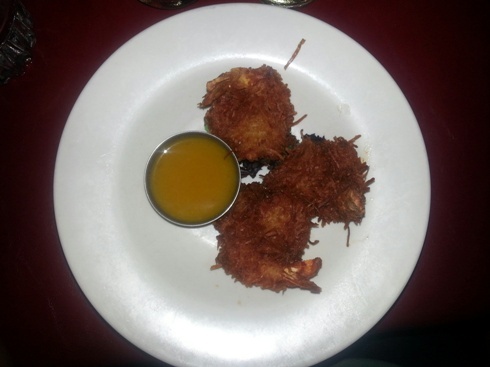 I find whenever I order coconut shrimp somewhere, they don’t taste like anything special. These however were breaded in the right amount of coconut and wasn’t dried out. The marmalade dip fused nicely with the shrimp taste to finish it off. Jen ordered: House Salad (mixed greens with Big Daddy’s Vinaigrette). She enjoyed the vinaigrette, which she requested be brought on the side. She also commented that normally when you ask for dressing on the side, you don’t get as much and was really impressed with how much they had given her. 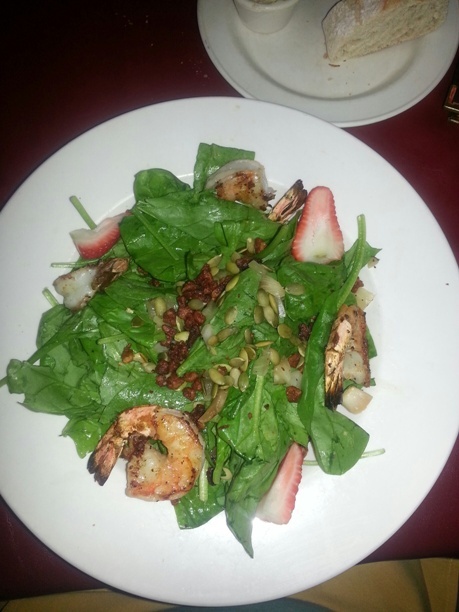 I ordered: Summer Shrimp Salad (Fresh spinach leaves tossed with grilled onions, candied pecans, toasted Pepitas, grilled vegetables and fresh strawberries tossed in an orange and pepper vinaigrette, topped with 4 jumbo marinated and grilled shrimp). I should start off by saying I am not a pecan fan but having them mixed with the pepitas (which I love) worked great in this salad. The shrimps were HUGE and so tasty – they were definitely seasoned before they were grilled, and the vinaigrette completed the fruity kick started by the strawberries. Also – I was surprisingly full once I’d finished it. It was SO yummy. Jen ordered: 8oz Striploin Steak (With garlic red skin potatoes, seasonal vegetables and a red wine cracked pepper sauce) medium rare (at the suggestion of the server since it was a striploin) and loved every bite. During her meal she commented: “I highly recommend this” – a few times, actually! She said it wasn’t dry (cooked just right) and was very tasty. Too bad I don’t eat beef, because she had me wanting to try a piece the way she was raving about it. She is also usually picky about potatoes but inhaled every bit that was on her plate. 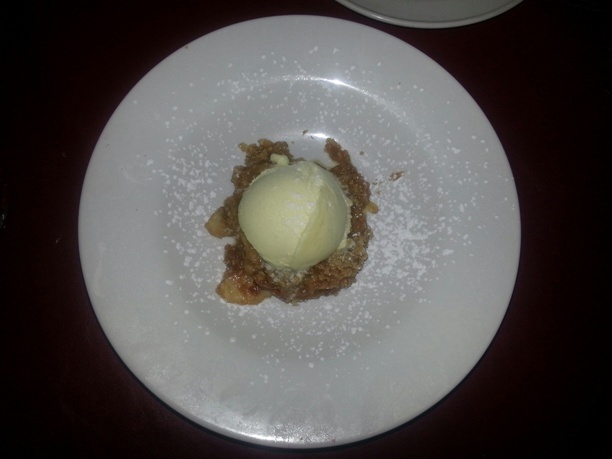 I ordered: Apple Crumble (Served warm with cinnamon sugar and vanilla ice cream) – it was delicious, a bit on the sweet side for me but that’s because I don’t indulge in too many sweet things. The ice cream was great – soft and rich. Jen ordered: Sweet Treat Cupcake – Red Velvet – but was underwhelmed by it, saying the Two-bite cupcakes actually taste better. She wasn’t all that upset, though, after her great steak. The prix fixe dinner price was $25 plus tax and tip, so I took the liberty of ordering some wine. Of course. Their regular prices were comparable to other restaurants and quite reasonable. I would definitely return to this restaurant, even if it isn’t during “licious” time. Jen said the same; we both left very pleased with our meals and the service. We were pleasantly surprised that even though these were summerlicious items, each course was still filling. The location is also very easy to get to, with other activities around to take advantage of, depending on the time of day you go for your meal. Since my first very positive oyster experience at Rock Lobster Food Co. (check out Ash’s review here), I will be returning to try their oysters! 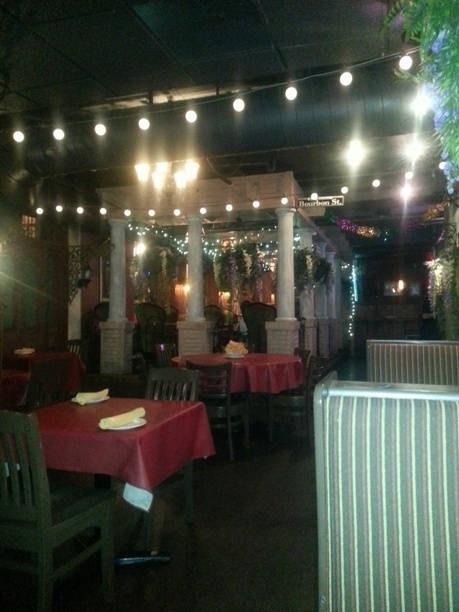 Big Daddy’s Bourbon St Bistro & Oyster Bar is located at 212 King St W (W of Simcoe St) 416-599-5200. Very true – it was a very positive experience indeed. It’s been years since I last ate at Big Daddy’s, but it sounds like the food is as good as ever! They used to have a really cool area called the Voodoo Lounge where you could sit and have drinks, but I think they got rid of it when they renovated. 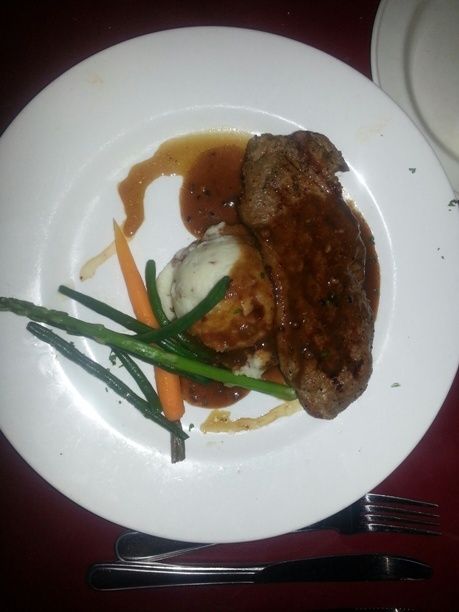 The dishes you and your friend tried sound delicious, thanks for the review! I don’t know what took me so long but I’m glad I went (and enjoyed it)! I love Big Daddy’s and this great review made me want to head there immediately. Im hungry! In a few weeks I’ll be able to see how this compares to real cajun eatin’! Gah! Can’t wait to read about it!